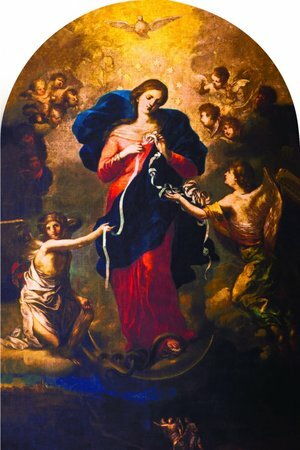 Here’s Day 8 of The Our Lady, Undoer of Knots Novena! How funny to me that on this day when my husband and I returned home from mass, we had a stray cat wandering our pier. And she remains two day later just wanting love and attention. I was asking for assistance with my inability to conceive or for a sign telling me to wait/be patient. I love this answer I know was from God. Blessed Mother, Please intercede for me and undo the knots that I have been struggling with these past few months. And that God will give me strength and peace. Mary, Please untie this knot for people in my family that are in purogy and bring them to your Son Jesus i trust in you!! Holy Mother Mary, please untie undo the knots in my son’s med school applications and send out the secondary app tomorrow and then acceptance and seat in CAUSM, to start from July this year and to complete medicine and become medical doctor soon. Holy Father hear , Holy Jesus fulfil this promise today. Amen and thank you mother Mary for accepting my novena and prayers. Sweet blessed Virgin Mary, I pray for all souls in purgatory. I say a little pray and the sign of the cross when I see a cemetery. I also ask you Mother Mary to help lift the knot of unemployment and uncertainy in my daughter’s family and that whatever Gods will is I can except and be at peace. I pray for Iennon my friend who is going through difficulties with the drugs that he is into. Help him that he will be able to give it up and get something to do. I lift my cousin Nicole to you that something will come between she and Pentecostal church that she is going to get baptise in. I make this prayer in Jesus’s name Amen. Please help my father with his confusion, due to his age. And help my mother and other family members to understand his confusion as part of the normal aging process. He is an awesome man, who has helped and continues to help and assistance his children and to his employees in his business. He is a good man who has lead a good life. I pray that when his time comes that you welcome him into your arms. Mama Mary, please pray for the healing of the relationship of my mother and grandmother. May you continue to pray for my brother’s safe travel to us this May 9 2018. I have so many knots I don’t even know where to begin…so I ask you, please undo them all. Please Undo my husband’s, anxiety, depression and diabetes knot, and drinking. He can be so nasty a day after when he resorts to drinking to anesthetize his physical and mental anguish and the weight of his job demands. It is also a poor example to our youngest son who now thinks it is okay to get angry at your mother. Help him to turn to Jesus when he is stressed. Undo the anxiety and depression for two of our sons and one son in law. Please ask Jesus to bless and protect our whole family. Help me, Mary. It is hard to see loved ones suffer. Please heal my dear friend who has been suffering with a chronic sinus issues for a long time. Grant her healing. Help me Mary to be like you. Please tell Jesus I love HIM with all my heart. Please hear the prayers of all the people who need your assistance, Mary! Please cast away all evil that enters into my home, my family, myself lord. Bless my womb that i’d be able to comfortably carry our beautiful healthy twins full term; Samuel-Jacob and Jenna-Leigh. Lord, please guide and bless Anya-Marie with the wisdom and knowledge to know you, love you and serve you greatly. To do greatt in her school work as well to obtain her first choice Holy Name Convent. Lord, please help my husband Joel to accomplish his ACCA completion qualifications and I truly thank you for all that he’s accomplished thus far. Lord, please protect and elevate our parents, siblings, families and friends as well Lord, I want to add Clyde Quashie and Michael Ramdanee- Young o Lord, help them through their struggles, undo their knots lord and please help Michael to get his first choice of QRC. Lord, I know all things are possible through you. Everything I’ve accomplished in my life was possible only with you Lord I love you and I thank you for everything you’ve done and continue to do for me and my family. MARY UNDOER OF KNOTS I PRAY FOR FINANCIAL AND TRANSPORTATION HELP FOR ME AND MY FAMILY.THANK YOU SO MUCH FOR MY BLESSINGS.. MOTHER MARY,PLEASE HELP, MY,MOTHER VIVINENNE DIANA SAMUEL AND ME CONRAD DSOUZA AMEN. AND ALL MY FRIENDS AND FAMILY.